When dozens of rail cars filled with 10 million tons of raw sewage stalled in the middle of her town earlier this year, Parrish, Alabama Mayor Heather Hall immediately called state environmental regulators. The waste—mostly biosolids, or treated human waste—was leaking from the cars into the ground, she told them. People living less than a hundred yards away were having respiratory problems. Almost all of the town’s nearly 1,000 residents could smell sewage every time they went outside. The spring humidity and heat were making it substantially worse. The agency told her that the biowaste in train cars was out of their jurisdiction until it reached the landfill the next county over. So she called the Environmental Protection Agency. She said they told her that they couldn’t do anything about an odor—it wasn’t hazardous, and it was out of their jurisdiction anyway. The landfill company, Big Sky Environmental, said they couldn’t regulate it or even look inside the rail cars. The railroad company didn’t respond to her queries. The rail cars were stalled for two months in Parrish. Until the fiasco, Hall was unaware that the Alabama Department of Environmental Management had approved a permit last year for waste management companies from New York and New Jersey to send millions of gallons of sewage by rail to Big Sky’s landfill the next county over. After the news of the “poop train” broke, she received calls from rural communities all over the South—one in Kentucky, several in Alabama—and elsewhere in the U.S. They told her about their long-fought, and rarely won, battles with state environmental regulators to stop trash, sewage, and other waste from being brought into their towns. This points to a pattern throughout the South: the region has long been a dumping ground for other states and industries due to its lax environmental regulations, lower land value, economic disparities, and systemic racism. Rural towns provide the ideal location for waste disposal sites. Not only are there fewer people, but unincorporated communities outside of cities often don’t have the same level of services like water and sewer systems, making the towns less economically valuable, said Ryke Longest, director of the Environmental Law and Policy Clinic at Duke University. It’s difficult to finance improvements to these systems, and they also may not have zoning laws or ordinances to prevent waste from coming into close contact with residents, which was the case in Parrish. There are three main factors that lead many places in the U.S. to send their waste South, Longest said. First, the U.S. hauls solid waste to places with “lower land value.” Second, Jim Crow-era laws made it difficult for people of color to own desirable land and locked them in those economically disadvantaged locations. Lastly, he said, when regulators deal with pollution, they are “always thinking about the most economically efficient thing to do,” which often intensifies discrimination. “The South is more economically disadvantaged,” Longest said. In the South, poverty and inequality have increased in areas of rapid population growth. Last year, a United Nations official said that Alabama has the worst poverty he had ever seen in the developed world. The rural region of Appalachia has some counties with poverty rates 1.5 times the U.S. average. Climate change will likely exacerbate these problems, according to a 2017 study: as global temperatures get warmer, Southern states will suffer more economic disadvantages and inequality than other parts of the U.S.
It’s not always clear who to turn to when a community does have a problem with pollution: regulatory agencies are a patchwork. Municipal solid waste, industrial, and hazardous waste landfills must meet federal EPA requirements, although state environmental agencies like ADEM handle permits for incoming waste. They’re required to hold a public hearing before approving a permit, but local people don’t always receive the information and often find out about it after hazardous chemicals, foul odors, or other contaminants have taken a toll on the community. In 1984, the town of Emelle, Alabama—located in Sumter County, which is predominantly Black—took in about 347,000 tons of toxic waste from all over the country to a landfill that sits on one of the state’s largest aquifers. At the time, the prosecuting attorney in the town’s lawsuit against the company called Emelle ''America's biggest industrial pay toilet.'' It’s still in operation. 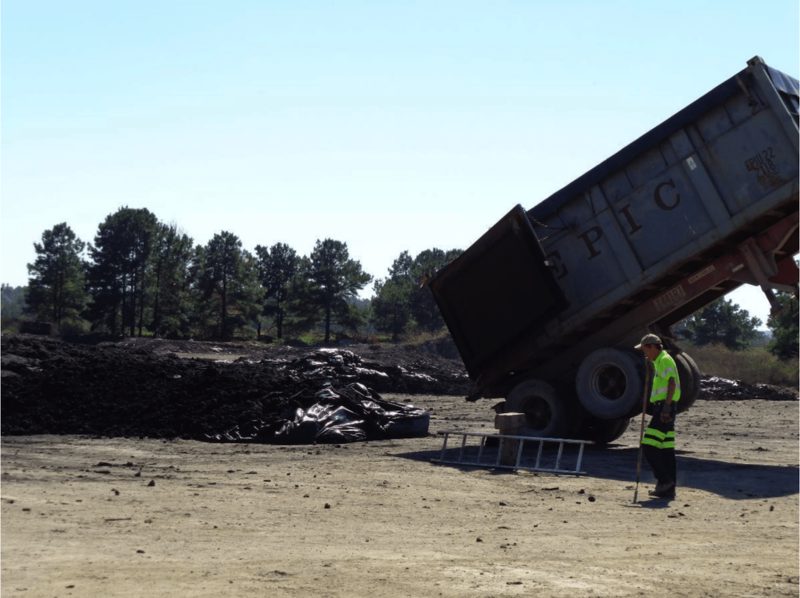 Alabama residents have repeatedly raised concerns about the growing number of landfills; according to ADEM, there are 180 municipal solid waste landfills in the state. By comparison, there are only 27 in New York, a state with nearly five times the population. One of the biggest landfills in the Southeast is Big Sky Environmental’s landfill in Adamsville, Alabama. In 2016, ADEM permitted wastewater treatment plants in New York and New Jersey to send 380,000 tons of biosolids, or treated human waste, a year to the landfill. Treated sewage is often permitted in landfills because it is used as a fertilizer to encourage plant growth. It’s also lucrative in a overwhelmingly poor state: the state collects one dollar in fees for every ton of waste disposed of in landfills. The rail cars stopped at a transfer station in unincorporated Jefferson County, where the sludge was loaded up on trucks to take to the landfill. West Jefferson Mayor Charles Nix fought with Big Sky for nearly a year before he won a lawsuit to stop the company from using the railyard. That meant the rail cars got backed up even farther away, in Parrish and also in North Birmingham. In late April, the more than 80 cars were dumped out and the mess was cleaned up. ADEM declined to answer questions on the record for this story, and did not give a reason for declining. The small town Alabama mayors discovered they were dealing with an issue that affects disadvantaged communities across the region. The environmental justice movement began in Warren County, North Carolina, over a landfill in a predominantly Black community filled with PCBs. Residents in Jessup, Georgia, spent years fighting to prevent a Phoenix-based company from dumping coal ash in their community. The 42-acre Environmental Waste Solutions landfill in Camden, Tennessee, just west of Nashville, was permitted by the Tennessee Department of Environment and Conservation to take in "special waste" from aluminum, coal and railroad industries as well as diesel fuel from a Superfund site. Test near the abandoned site still show high levels of carcinogenic chemicals like cadmium. For more than a decade, the Big Run landfill in Boyd County, Kentucky, accepted 3,500 tons of waste a day, including sewage sludge from the Northeast, after it was permitted by the state to expand in 2005. The majority of the trash was from out of state, and the county made around $1 million a year off the deal. For years, residents complained to state and federal environmental regulators about the odor, to no avail. “It was like sticking your head down in a septic tank and living in it,” said Kenny Messer, who started the Citizens of Boyd County Environmental Coalition with his wife, Candy. The Messers’ coalition filed a lawsuit against the company and the Kentucky Energy and Environment Cabinet, claiming the landfill expansion was unconstitutional. In late 2015, they won the case and the company said it would stop accepting sewage sludge and close down parts of the landfill. “If you wanted to cut grass or plant flowers or sit on the porch you couldn’t. If you went to Walmart, you’d have to run to the front door and when you came out, you’d take a breath and run back to the car. The Trump administration has rolled back environmental regulations on the federal level to make policies more friendly to business and industry interests.The EPA moved to give states more flexibility in how to handle coal ash disposal by announcing more than a dozen changes to the the 2015 Coal Combustion Residuals rule, which was the first time the federal government finalized rules for coal ash disposal. The agency also delayed the Waters of the U.S. Rule, which defines what bodies of water are under federal regulation, which some say may make it more difficult to penalize polluters. There hasn’t been evidence of a focus on these problems at the regional EPA office, either. Trey Glenn, the former director of ADEM who was accused of ethical violations and resigned from the post in 2009, went on to work as a consultant for a company that worked with Big Sky Environmental before he was appointed by EPA chief Scott Pruitt as the agency’s Southeast regional director. When asked about Big Sky, Southeast regional EPA spokesperson Dawn Harris-Young said Glenn was “recused from the topic” because of his work with Strada Professional Services, which contracted with the company. “Being partners with our states by maintaining open/transparent lines of communication and holding regular meetings with leadership to address concerns or potential barriers are key to ensuring all stakeholders are heard,” he said. However, despite the concerns of many local communities, most permits for landfills and other waste disposal sites are approved. There’s a historic pattern of Southern environmental regulators siding with business interests, with recent examples in almost every state: regulators in Kentucky recently approved new coal ash pond; last year, Louisiana officials approved a permit to keep a landfill open despite complaints from residents; Tennessee regulators are moving forward with a plan to build a new landfill despite community concerns. There are a few realistic ways to improve these processes, Longest said. State environmental regulators can hire an Ombudsman, or representative, to advocate for people in any given community, or set up an environmental justice office. Under the leadership of an environmental head appointed by Democratic Governor Roy Cooper, North Carolina just launched an advisory board to counsel the state’s Department of Environmental Quality on such issues. Long-term, he hopes Congress will eventually pass the Environmental Justice Act, sponsored by Sen. Cory Booker (D-NJ), which would require federal agencies to factor environmental justice into their permitting decisions, “instead of relying entirely on the good will of state and federal agencies,” Longest said. After media exposure, a year of legal battles with Alabama regulators and the landfill company, New York City officials reportedly said they would stop sending their sewage to the landfill, though it’s unclear where the city will send it instead. Nix and Hall both said they changed town zoning laws so the companies would have to reroute the trains, and denied business licenses to Big Sky Environmental, but that’s the last they’ve heard from regulators about the issue. Hall said that with these small tweaks to the local laws, she hopes the nightmare of the last few months is over. But she worries about how long this will go on for other towns all over the U.S.